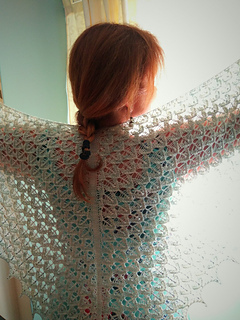 Fionnuala is the first pattern in the Ladies of Legend Collection. NO!!! screamed Fionnuala spreading her arms around her brothers in a vain attempt to protect and save them. But it was no good. The spell had been cast. As the morning mist cleared there on the water, where only moments ago the four children had huddled, were four graceful white swans. One beautiful large swan with wings spread wide protecting three smaller ones! 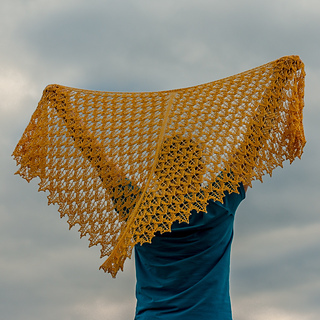 Fionnuala is a triangular beaded lace shaped shawl beginning from a garter stitch tab. Her gently flowing increases allows her to open out like the swans wings she was inspired by. 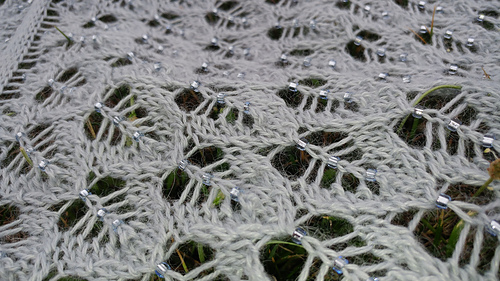 Lace and beads are worked on both right and wrong sides of Fionnuala and this is what gives the open lace feather shapes to her “wings”. A delicate beaded picot edge further enhances the feather effect. Sample was worked at a gauge of 23 sts and 36 rows = 4” 10cm stockinette stitch using 4mm needles (blocked). Pattern includes charts and full written instructions with bead placement shown clearly in both sets of directions. You may find it useful to print your pattern on a colour printer though should you not have one you could always use a coloured pencil to mark your beaded stitches.